No, not a Walmart story! 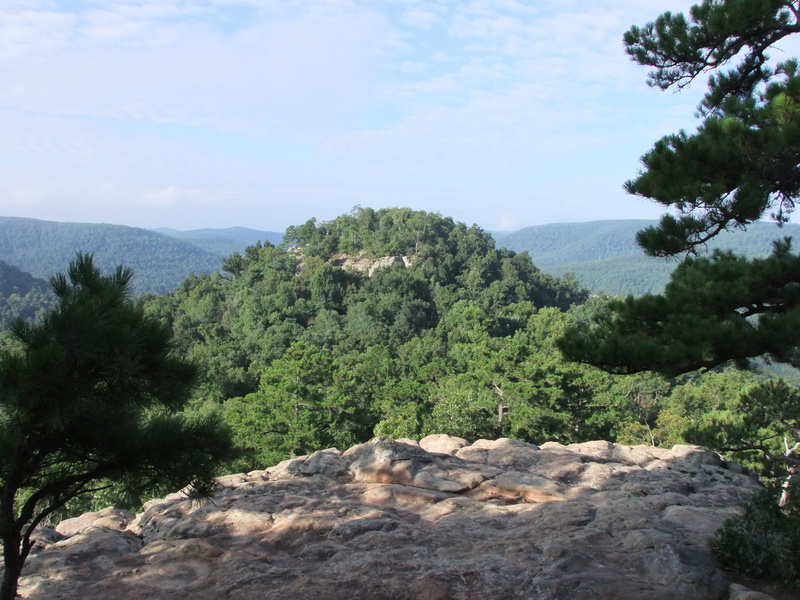 Sam’s Throne is basically a rocky knob on the east side of the Big Creek valley. 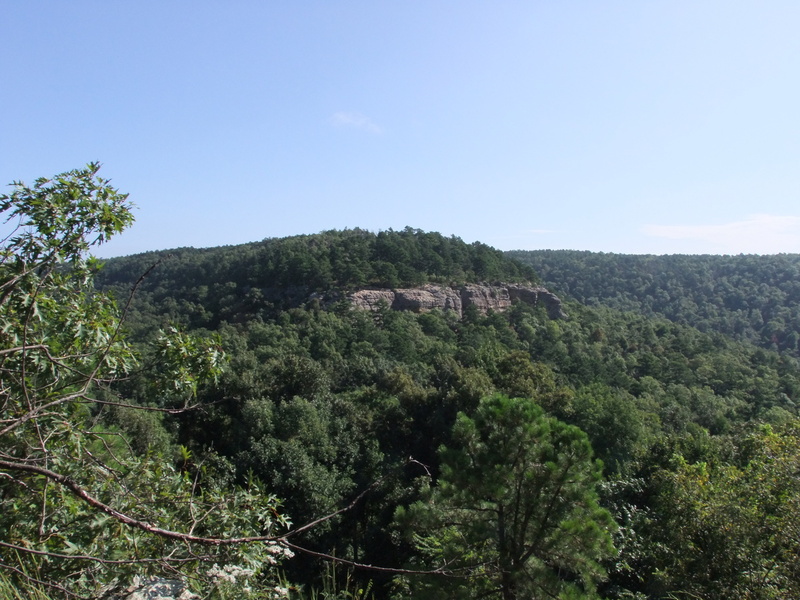 It has sheer bluffs on all sides that are probably 40-60′ high and has some great views in all directions. It’s south of Mt Judea (pronounced “judy”), Ark on the west side of AR 123. The short story behind the name is that a while back some guy named Sam would climb up there to yell biblical stuff at his lucky neighbors in the valley below. And here’s a look back at that peninsula from Sam’s Throne: At the end of the campground road there are three openings through the fence and each is a blazed trail that goes out on the peninsula. The left one goes to the east bluff rim, the right one goes to the west bluff rim and the center one goes pretty much straight out to the point. They are all ultimately connected so you could for example, take the left trail to the bluff and follow the rim around to the right until you see the blazes for one of the other trails for the return. These three are the only official trails in the area. 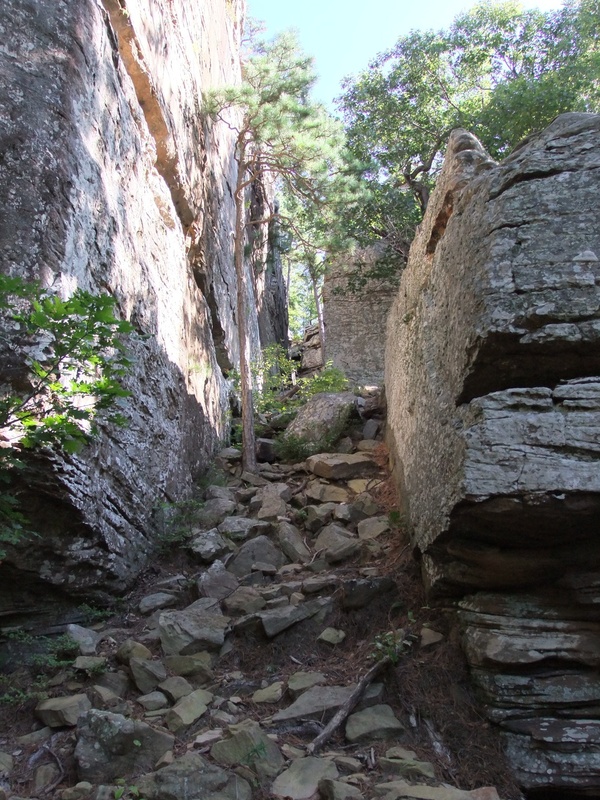 There are paths worn by the numerous visitors over the years that go along both the rim and base of the west bluff out to the point and then back along the length of the east bluff. At the base of the bluff below the point there is a path leading over to and encircling Sam’s Throne. These paths are often very brushy with lots of briar and poison ivy so long pants are recommended. Over the course of 5.5 hours I managed to explore the rim and base of both bluffs around the campground, the top and perimeter of Sam’s Throne, and make my way south toward the caves and waterfall (I didn’t make it that far – maybe next time). This was one of the more satisfying hikes I’ve done in a while. Okay, how about some pictures? Part of the bluff around Sam’s Throne. Atop Sam’s Throne – looking up the Big Creek valley. Atop Sam’s Throne – looking down the Big Creek valley. Here’s the best map I’ve found for the area, with some caveats. 1) These paths are not GPS tracks – they’re just hand-drawn. 2) What it calls “official trails” mostly aren’t – no markings, no maintenance, and sometimes routed in a way that no sane trail builder would. They’re just paths beaten down by thousands of shoes over the decades. 3) Of the three trails from the parking lot only the middle one is shown. 4) The upper red-lined bushwhack to “The Point” is apparently going onto private property. I don’t know the story here and will stay away from that area until I know I won’t be trespassing. 5) There are other paths out there that aren’t on this map. About getting on top of Sam’s Throne: A big chunk broke off long ago and started moving down the slope, leaving behind two narrow debris-filled slots. One can climb this debris – it basically forms a steep ramp – to within about 15 feet of the top of the bluff. After that, you must do a bit of rock climbing to go straight up the rest of the way through a body-width slot. It’s not for klutz’s, especially the coming down part where you can’t really see where your feet are going. You will see markers around the area commemorating climbers that have died out there. Something to think about. Incidentally, this broken-off piece is apparently the actual location from which Sam made his speeches. He had a plank that he would lay across the gap so he could walk over to it.